Election 2017 Victories are Nurse Victories! Although the 2017 elections were local, the stakes were high throughout New York State. A statewide ballot initiative, along with several high-stakes mayoral and county executive elections, moved NYSNA’s Political Action Team to action. Throughout the state, nurses hit the phones and the streets to educate fellow nurses, union members and neighbors about the dangers of the proposed Constitutional Convention. We also campaigned for the NYSNA-endorsed candidates who have advocated on behalf of nurses and our patients, and who deserve our support. We are proud to report that our efforts paid off! The Constitutional Convention was soundly defeated, in large part because of nurses’ and labor’s efforts! Over 83% of voters rejected the proposal, which would have threatened public pensions, our union rights, and so much more. Around the state, NYSNA-endorsed candidates prevailed. In NYC, voters overwhelmingly voted to re-elect Mayor Bill de Blasio. In Westchester, George Latimer handily won County Executive; on Long Island, Laura Curran won a tight race for County Executive; and in Buffalo, Mayor Byron W. Brown sailed to an easy reelection. In Albany, Kathy Sheehan was reelected mayor, and NYSNA's own Corey Ellis was elected Common Council President. These are not only victories for individual candidates; these are victories for nurses, who by making our voices heard for the candidates who commit to advocate for us, will be able to call on these elected officials in years to come to fulfill their commitments from the campaign trail. As nurses build our political power, our calls for safe staffing, quality healthcare for all, and our other policy priorities will be too loud to ignore! Dozens of nurses around New York State stepped up this Election Year. NYSNA is especially grateful for the work of Ginette Marcharie, RN, who won first place in our member appreciation raffle. 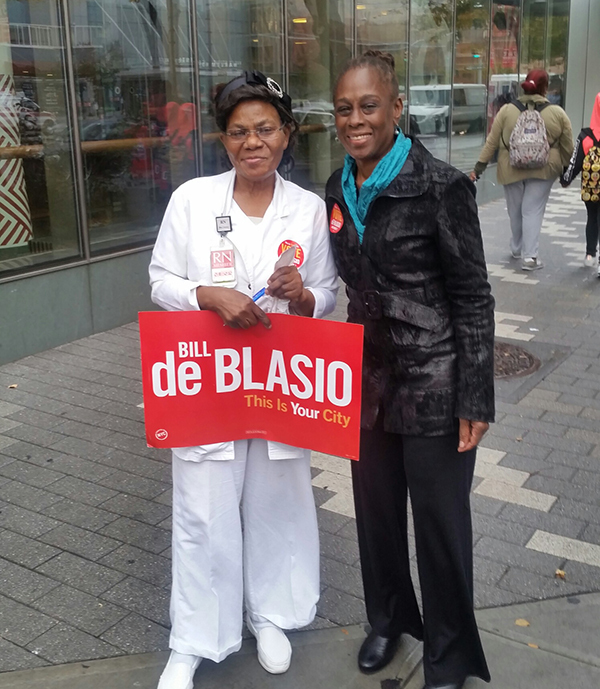 Marcharie, who has been a nurse for 20 years, is an active NYSNA member who regularly attends Convention and other events, but this was the first time she got involved in electoral politics. When asked if she would volunteer the next time there was an important election, Marcharie did not hesitate. “I am excited to get more involved in politics,” she said. “When you’re a nurse, you love people and want to help them. Politicians can see that if you’re out volunteering, it’s because you care. You’re not doing this for more money, but because you want to see people get better, to see patients have insurance, to be an advocate. When nurses are involved in politics, it has more weight. Elected officials are not gods, but they’re important. They are the ones we need to convince that patients will die without insurance, and that a good public healthcare system helps everyone. When you volunteer and help, it’s rewarding—not just for patients, but also for you. It feels good! To join the Political Action Team, sign up online.